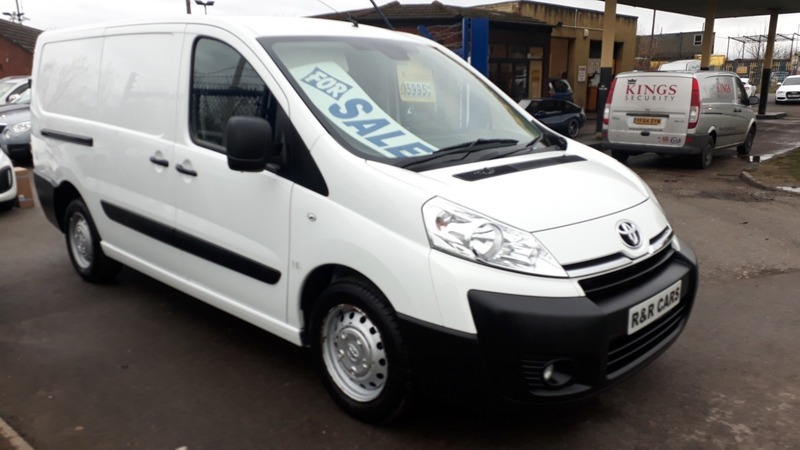 2013 Toyota Proace 2.0HDi 1200 L2H1. 82,000 miles with full service history noted at 13k, 29k, 46k, 61k and 77k. This van includes remote central locking, 2 keys, power steering, electric windows, electric mirrors, steering wheel controls, air conditioning, trip computer, CD player. More vans in stock - please visit our website www.randrcars.co.uk. Any part exchange is welcome (with or without MOT). We offer finance with affordable monthly payments. Even if you have been refused before or have poor credit we may still be able to help you. Own this vehicle from as little as £136 per month. No deposit, easy on line application, drive away same day. Free 12 month AA breakdown cover available. Extended warranty is available, please ask for more details. We also offer delivery on all vehicles, please feel free to ask us for a quote. We would recommend calling before visiting to avoid any disappointment.